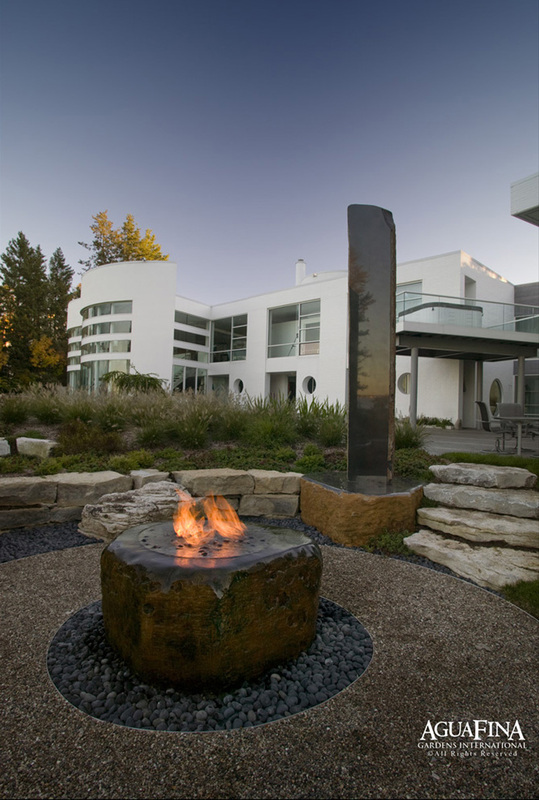 This modern garden fuses three strong elements – Water, Fire and Stone. 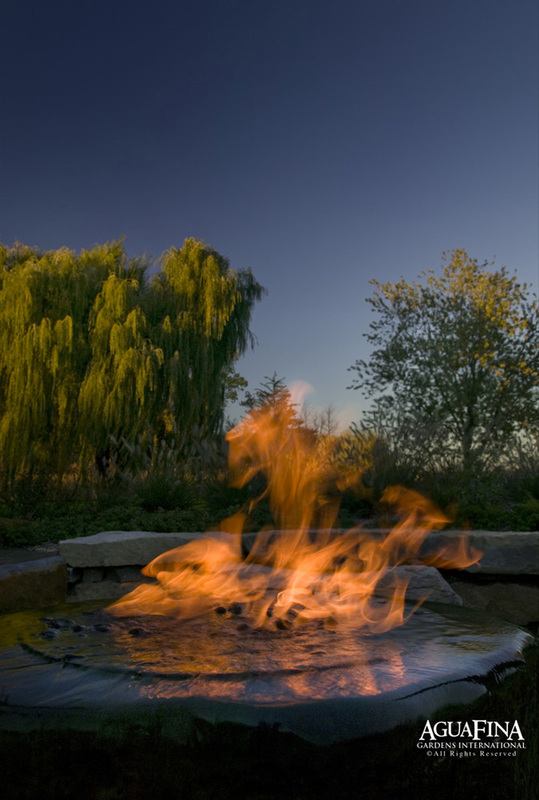 Central to this garden is the fire and water feature emanating from a large basalt stone that has been cut, hallowed and polished. 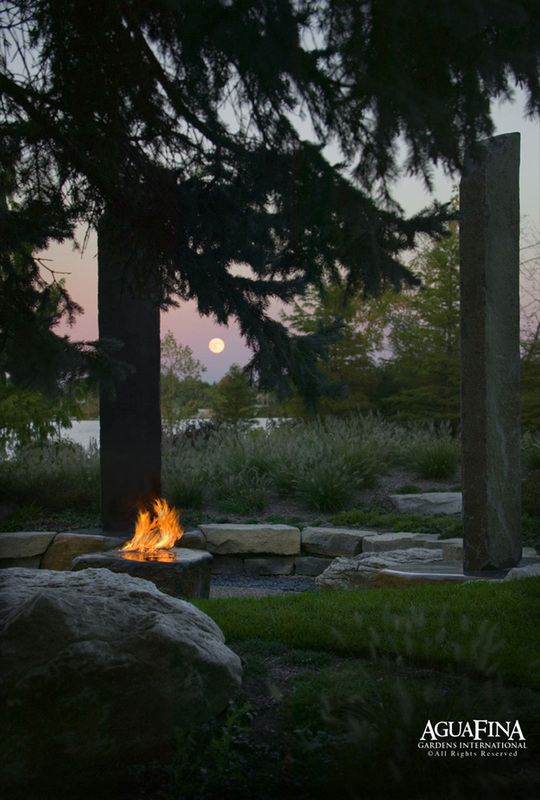 Water flows over the sides of the piece into the basin below which encompasses the entire pea gravel walkable surface that is used for the patio area. This surface acts as collection zone to recharge and replenish the fountain with rainwater while gravel functions as part of the filtration. 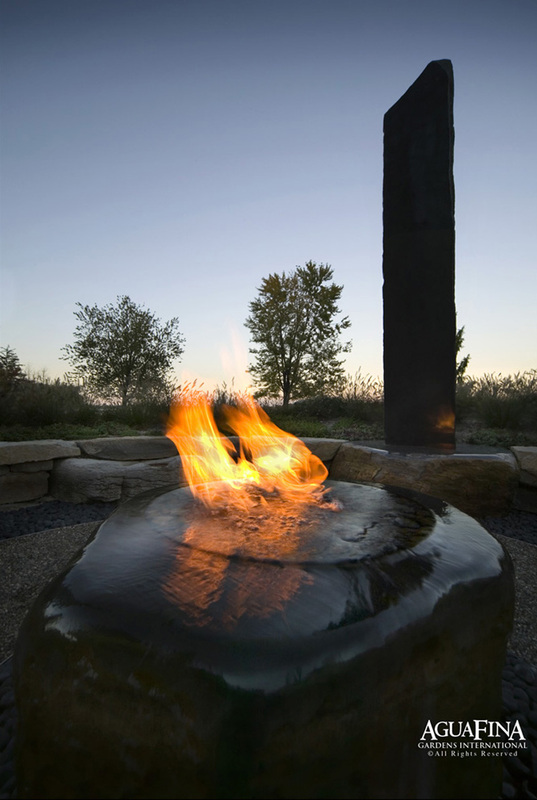 Unlike other fire and water features where the fire and water are separate, in this system the water and fire are integral. The water is infused by gas and then the gas “off-burnt”, using a proprietary technique that AguaFina developed for this effect and has used on similar projects. Challenging for this site was creating a small intimate gathering area within the context of a larger setting. Set on a flat piece of land adjoining a very popular lake, and at the same general level as the lake, the back of the home was quite exposed. 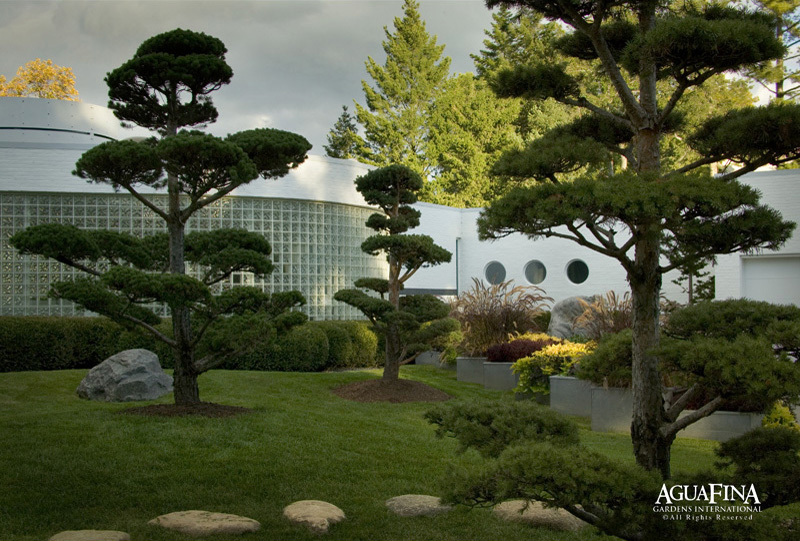 In order to achieve an intimate and nestled feel, the area for this gathering space was “sunk” by slightly lowering the grade and creating natural berming with mass plantings. 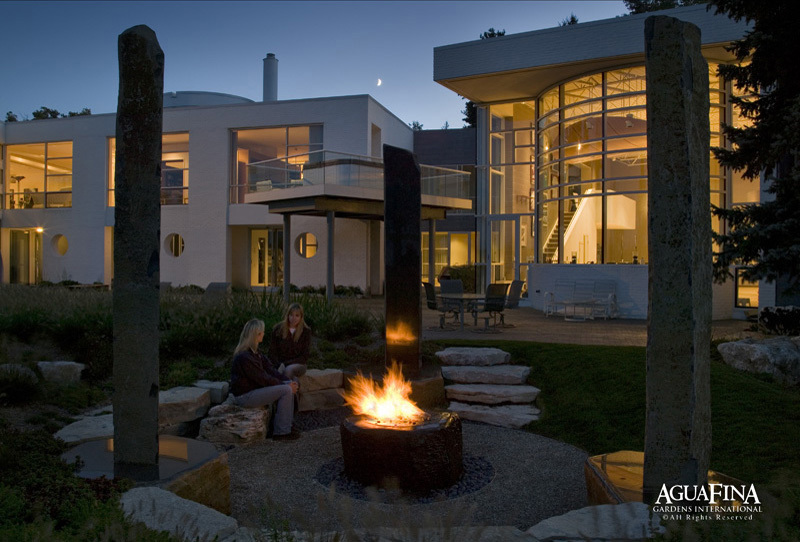 Further accentuating this nestled feeling, large monolithic stone basalt pillars amplify the lower aspect of the space. Polished on one side and natural on others, the polished surface reflects both fire and the natural sun as it sets. 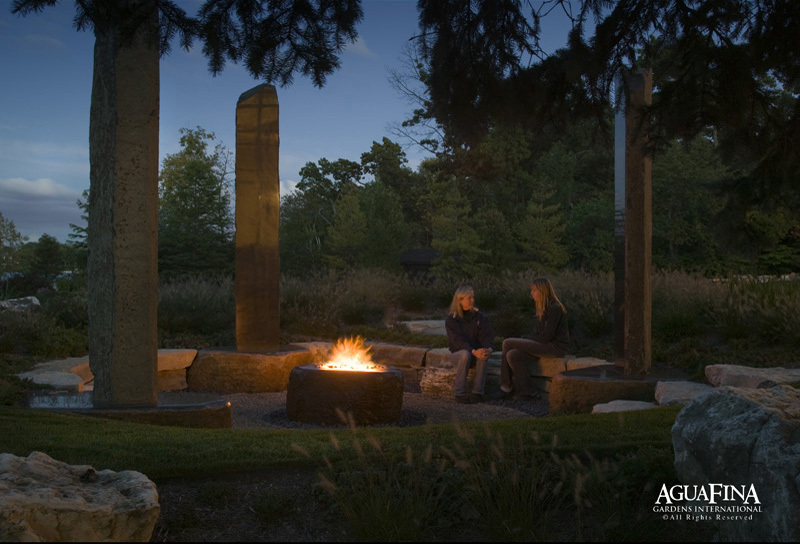 These pillars are set upon larger base pieces, also of basalt, that are incorporated within the retaining wall designed as a seating area. Other uses of stone integral to this project includes contrasting black Asian gravel along with finer texture and lighter colored pea gravel. 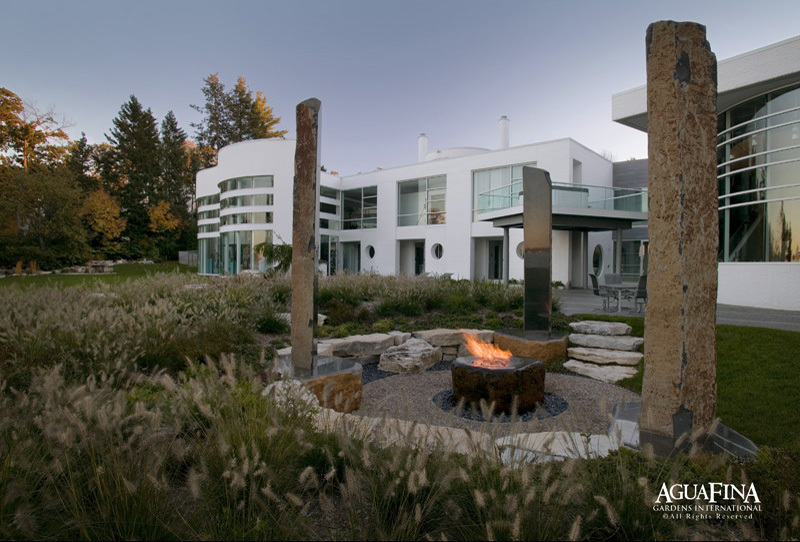 Hand selected weathered limestone boulders accent and anchor the garden and are also used as stepping stones through the mass planting of fountain grass and other perennials.